Jatrophas are oil plants belonging to the Euphorbiaceae family. The Jatropha genus includes more than 175 species, among which Jatropha curcas L. and Jatropha platyphylla Müll. Arg. have drawn particular attention as potential biofuel and animal feed sources. Jatropha curcas has both toxic and non-toxic genotypes while Jatropha platyphylla is a non-toxic species (Makkar et al., 2012). Jatrophas are drought-resistant perennial and multipurpose shrubs or trees, similar to the cassava plant (Elbehri et al., 2013). 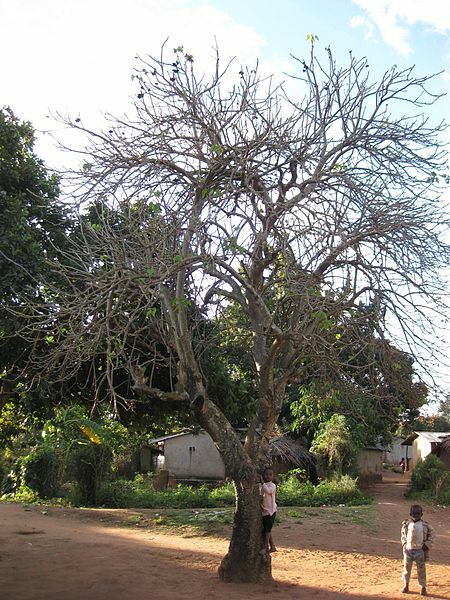 Jatropha is a deciduous tree, shedding its leaves during the dry season. It can grow to a height of 3-5 m, and remains productive for 30 to 50 years. Jatropha has a deep taproot and four shallow lateral roots. The taproot anchors the plant in the soil, stabilizing the soil against landslides, and the lateral roots prevent soil erosion. The trunk is covered with a smooth grey bark that exudes watery and sticky latex when cut. The leaves are smooth, 4-6 lobed, 10-15 cm long and wide, and are usually pale green in colour (Raheman, 2012). Inflorescences develop at the apex of the branches and bear approximately 10 or more ovoid fruits (pods) (Makkar et al., 2012). Flowers and fruits develop during the rainy season or year-round in permanently humid regions. The pods contain many elliptic seeds and become yellow when they mature. Dry jatropha fruits contain about 38% husks and 62% seeds. The seeds look like castor seeds in shape, and are black in colour (Raheman, 2012). They consist of 30-40% testa (shells) and 60-70% kernels. The kernels contain 44-62% oil (King et al., 2009). Most Jatropha species, including Jatropha curcas, contain numerous toxic components and the plant and its by-products, when not detoxified, are deleterious to humans and livestock. One species, Jatropha platyphylla is non-toxic and is eaten by indigenous people in the Sinaloa State of Mexico, who call it "sangregrado". This species has thick succulent branches and its leaves, borne on long petioles, are glabrous and larger (25-35 cm) than those of Jatropha curcas. Its seeds are almost circular and contain 50-60% edible oil (Makkar et al., 2011). Jatrophas are multipurpose plants. The name jatropha was derived from the Ancient Greek words iatros (doctor) and trophos (feed) because of its many potential medicinal applications (Elbehri et al., 2013). Jatropha seed oil is used to make soap, lubricants, varnish, insecticides or medicines (Raheman, 2012). It has good feedstock qualities for biodiesel production. Jatropha biodiesel meets European Union (EN14214) and North American standards (ASTM D6751) (Makkar et al., 2012). Jatropha oil cake (oil kernel meal) results from the oil extraction of decorticated seeds. It can be used as fertilizer or as feedstock in biogas production. Jatropha kernel meal is a protein-rich product, but only kernel meal obtained from non-toxic genotypes of Jatropha curcas, from the non-toxic species Jatropha platyphylla, or detoxified kernel meal from toxic genotypes of Jatropha curcas can be safely used as feed resources (Makkar et al., 2012). 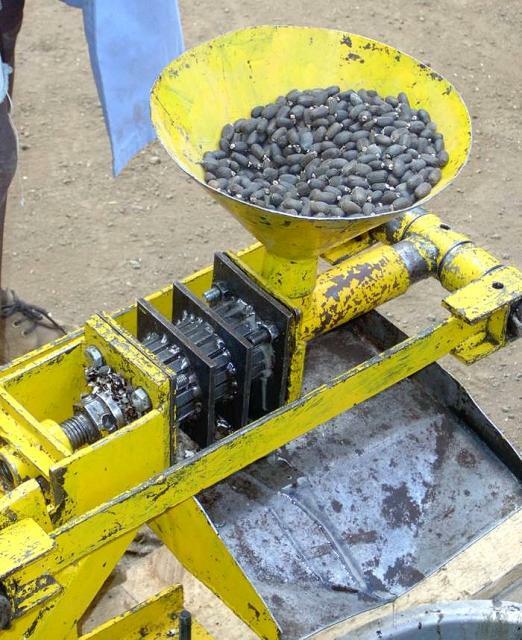 Jatropha seed meal is obtained after the extraction of non-dehulled seeds. Jatropha plants are used to make fences and shelter to protect from animals, wind or erosion (Elbehri et al., 2013). Jatropha roots yield an oil that has anthelmintic properties. Jatropha leaves are used as feed in the rearing of silkworms, and in human nutrition as a vegetable for their antimicrobial and anti-inflammatory properties (Makkar et al., 2009). Whole seeds of the non-toxic genotype are sometimes boiled or roasted and eaten as a snack by humans. Jatropha latex is used as dye or as a pesticide/molluscicide. The fruit hulls can be used as green manure or to produce biogas. In the 2000s, the cultivation of jatropha was encouraged in many developing countries in order to provide both renewable energy and supplementary incomes (Promode Kant et al., 2011). By 2010, about 250 jatropha projects were running worldwide on a total area of around 900 000 ha (Elbehri et al., 2013). In India, millions of marginal farmers and landless people were encouraged to plant jatropha. In 2006, the Chinese Government decided to grow jatropha over 1 million ha of marginal lands. In Tanzania, more than 10,000 small farmers established jatropha plantations and many more have done so elsewhere in East Africa (Promode Kant et al., 2011). However, the results have been disappointing. In India, 85% of the jatropha farmers have discontinued growing it (Axelsson et al., 2011). In China, there is very little production of biodiesel from Jatropha seeds. In Tanzania, the results are very unsatisfactory: the net present value of a five-year investment in a jatropha plantation was negative, with a loss of US$ 65 per ha on lands with yields of 2 t/ha of seeds when the expected jatropha seed yield on poor barren soils is only 1.7 to 2.2 t/ha (Promode Kant et al., 2011). This "extraordinary collapse of jatropha as a global biofuel" has been ascribed by analysts to an overestimation of jatropha capabilities, as the species is not yet sufficiently adapted to cultivation to provide sustainably high yields and economic returns, together with a lack of diligence in implementing nationwide cultivation plans (Axelsson et al., 2011; Promode Kant et al., 2011). Jatropha is thought to have originated from tropical America (Mexico). It could have been introduced to other regions from the Caribbean by Portuguese sailors travelling to Cape Verde and Guinea Bissau. It is now available in many arid, semiarid, tropical and subtropical regions of the world as it is able to thrive in many climatic zones with a wide range of rainfall (200 to 1200 mm annual rainfall) (Raheman, 2012). 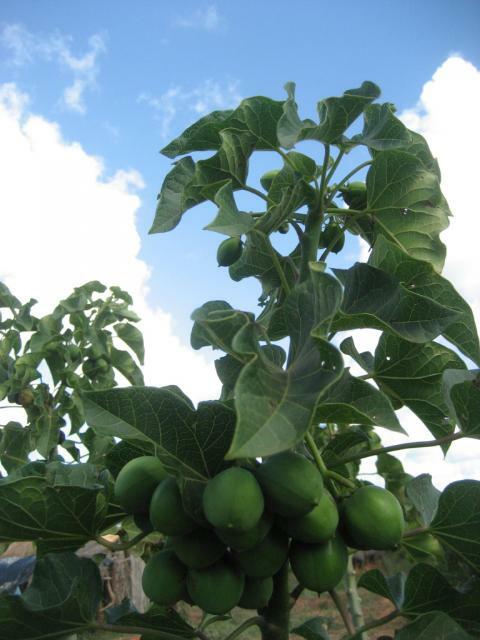 Jatropha is well adapted to arid and semiarid conditions. It can grow on marginal lands with limited water and agrochemical supply but will not yield enough seeds in such conditions (Elbehri et al., 2013; Raheman, 2012; Brittaine et al., 2010). Jatropha does better in areas with 1000-1500 mm annual rainfall, temperatures of 20-28°C with no frost, and where the soils are free-draining sands and loams with no risk of waterlogging (Elbehri et al., 2013; Raheman, 2012). However, it grows on almost any type of soil including gravelly, sandy, stony or rocky soils and in the crevices of rocks where soil depth and fertility are very low. It responds positively to fertilizer or manure with added calcium, magnesium and sulfur. For economic returns, a soil with moderate fertility is preferred (Raheman, 2012). 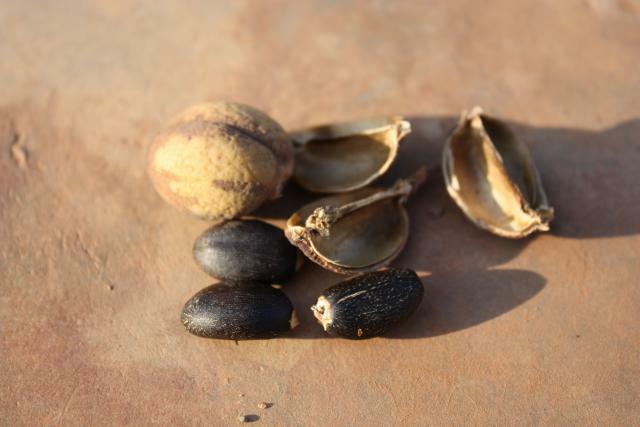 After harvesting, jatropha fruits are dehusked and the seeds are sun-dried and then shelled. The kernels are pressed for oil extraction, resulting in a protein-rich jatropha kernel meal. Because jatropha kernel by-products contain many toxic and antinutritional substances, different processes have been developed to mitigate toxicity or poor feed efficiency. These processes have been extensively reviewed by Makkar et al., 2012. Further methodological information on solvent and meal:solvent ratio can also be found in Makkar et al., 2012. In 2010, a process involving meal heat treatment, alkali treatment (up to pH=11), acid treatment (down to pH=8) with short-chain alcohol (for precipitation) was able to reduce phorbol esters below 3 mg/kg, thus allowing the use of the detoxified jatropha kernel meal in animal feeding and the production of a detoxified jatropha protein isolate (Makkar et al., 2010b). Jatropha is a fast-growing plant that can be propagated either by seedlings (generative method) or direct planting of cuttings (vegetative method) (Raheman, 2012). Jatropha cuttings can be planted directly in the field, in nursery beds, or in polyethylene bags, during the rainy season, at 10-20 cm depth in the soil. When jatropha plants develop from cuttings, they produce many branches but yield fewer seeds and have not enough time to develop their taproot, which makes them sensitive to wind erosion. Presoaked seeds (24 h in cold water), directly sown in wet soil or in seed beds under nursery conditions at the beginning of the rainy season are advisable for seed production. Jatropha can be easily intercropped with shade-tolerant plants, legume seeds such as black gram (Vigna mungo), and vegetables, such as tomato, bitter gourd (Momordica charantia), pumpkin, and cucumber can be profitably grown under jatropha plants for the first two years. Irrigation and fertilizers are beneficial during the establishment period. After establishment, irrigation is not necessary but fertilizer should be applied every year during the productive period. Pruning should be done to promote branching and subsequent fruit yield (Raheman, 2012). Depending on climatic conditions, jatropha may be harvested twice in a year under semiarid conditions, or continuously in more humids areas. Fruits have to be handpicked and harvest is time-consuming. Jatropha seed yields are variable, depending on growing conditions: in degraded land with low inputs, yields were reported to range from 1 to 2.5 t/ha/year; in fertile soils with high inputs jatropha could produce 2 to 5 t/ha/year (Elbehri et al., 2013). 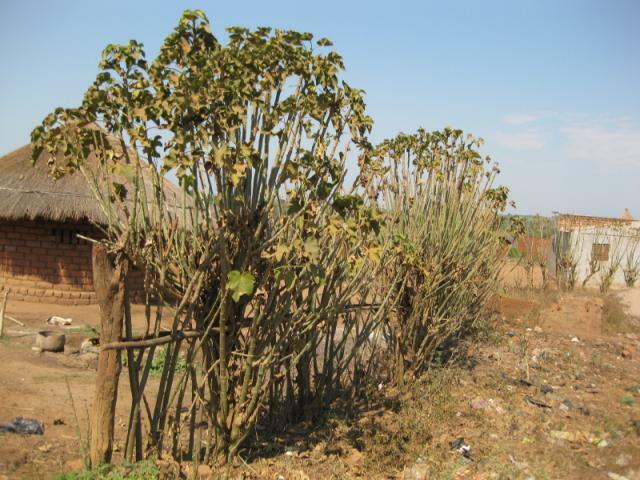 It has been noted that even on adequately fertile soils, jatropha is no match for sunflower and that the hugely variable yields have contributed to its decline in the early years of the present century (Promode Kant et al., 2011). Jatrophas, because of their taproot and lateral roots, can play two important roles in soil preservation. Lateral roots protect soil from heavy rains and provide soil cohesion, decreasing soil erodibility (Reubens et al., 2011; Henning, 2009). The deep taproot extracts subsurface soil moisture and enhances vegetative cover or allows intercropping, even in very dry environments. Planting jatropha in lines to form contour bunds improves rainwater infiltration. Jatropha hedges reduce wind erosion by reducing wind velocity and by binding the soil with their surface lateral roots (Henning, 2009). Jatropha is used as a living fence in many tropical and subtropical countries. Jatropha leaves are not eaten by livestock: goats would die of starvation rather than browsing jatrophas. When jatropha is intended for live fences, jatropha cuttings are planted as a hedge to protect homes, gardens and fields from wandering animals. Hedges planted very close together (5 cm) form a barrier that is impenetrable even by chickens (Henning, 2009). Jatropha seeds contain highly variable amounts of shells (30-40%) and kernels (60-70%) (King et al., 2009). Their crude protein and oil content is 16-18% and 34-37%, respectively (Makkar et al., 2009), while the kernels contain 22-35% protein and 55-58% oil (DM basis). Jatropha oil is mainly composed of unsaturated fatty acids, notably oleic acid (35-41% of fatty acids) and linoleic acid (35-43% of fatty acids) (Makkar et al., 2011). The composition of jatropha oil by-products depends on the extraction process. The scientific literature contains references to different jatropha products containing variable amounts of residual oil and shells. However, the potentially most valuable product is the defatted jatropha kernel meal, due to its high protein content. The main product is the jatropha kernel meal, obtained from the complete oil extraction of dehulled seeds. Jatropha kernel meal contains from 40% to more than 75% crude protein (DM basis). Well defatted jatropha kernel meal contains less than 2% oil. It is relatively low in fibre (crude fibre less than 10% DM). Starch content ranges from 7 to 12% DM. Jatropha kernel meal contains good amounts of phosphorus, potassium, calcium, and magnesium. The amino acid composition of jatropha kernel meal and soybean meal are similar, except for lysine content, which is lower, and for the sulphur-containing amino acids cystine and methionine contents, which are higher in the jatropha kernel meal. Jatropha kernel meal contains low levels of non-protein nitrogen (9% of total nitrogen), suggesting a high level (91%) of true protein (Makkar et al., 1998; Makkar et al., 2009). Several papers mention a jatropha seed meal obtained from the extraction of whole (non-dehulled) seeds. This product is much lower in protein (about 16% DM) and much higher in fibre (crude fibre more than 33% DM) than the kernel meal (Abd El-Rahman et al., 2011; Abdel-Shafy et al., 2011; Chivandi et al., 2006; Guedes et al., 2014; Sumiati et al., 2009). Jatropha shells are a low-protein (5% DM), high-fibre (ADF more than 75% DM) by-product of low nutritive value. Raw jatropha products tend to cause morbidity or mortality in different animal species. Toxicity of jatropha as a feedstuff has been studied extensively in several species including mice, rats, goats, sheep, and fish (Adam, 1974; Adam et al., 1975; Ahmed et al., 1979a; Ahmed et al., 1979b; Makkar et al., 1999). This toxicity is mainly due to phorbol esters and curcin (a lectin) (Nesseim et al., 2012). Others substances, such as trypsin inhibitors, lectins and phytate restrict the use of jatropha products in animal feeding. Jatropha platyphylla is free of phorbol esters and hence non-toxic. However, its kernels and kernel meal contain trypsin inhibitors, lectin and phytate (Makkar et al., 2012). Jatropha species contain lipophilic tetracyclic diterpenoids called phorbol esters, that are present in all parts of the plant, including the seeds, leaves, stems, roots and flowers. The largest concentration (between 2 and 6 g/kg DM) is in the seed kernel. Non-detoxified kernel meal contains from 1 to 3 g/kg phorbol esters, and the oil 2 to 7 g/kg (DM basis) (Makkar et al., 2012). A detoxification process, for example by combining an alkali (NaOH) and an alcohol (methanol) can remove most or all of the phorbol esters (Makkar et al., 2010b). There are low-phorbol genotypes and species, such as Jatropha platyphylla, that may provide a meal where phorbol esters are below the detection level (Makkar et al., 2012). Phorbol esters are known for their inflammatory action resulting in irritation and toxicity in insect, fish and mammalian species (Goel et al., 2007; Makkar et al., 2009; Nesseim et al., 2012). 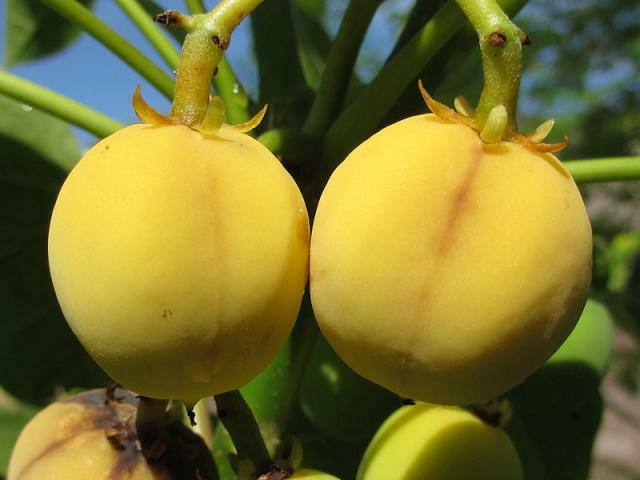 Jatropha curcas contains one of the most potent of the phorbols: phorbol-12-myristate-13-acetate, which is recognized for its tumor promoting activity (as a co-carcinogen) and is used as a biomedical research tool in models of carcinogenesis. Phorbol esters are toxic to livestock even at very low concentrations (Goel et al., 2007). In calves, mortality and severe liver, digestive, kidney and lung lesions were observed when they were fed diets containing only 0.25 g/kg Jatropha curcas seeds (Ahmed et al., 1979b). The same occured in goats fed similar doses of Jatropha curcas (Adam et al., 1975). In mice, intra gastric absorption of phorbol esters resulted in acute haemorragic gastro-enteritis with LD50 = 27.34 mg/kg live weight (Li et al., 2010). Jatropha contains lectins or haemaglutinins. These proteins represent 6 to 11% of the seed proteins and they play an important role as deterrents to herbivores (Nesseim et al., 2012). In Jatropha curcas, the lectin curcin has irritative properties. Curcin belongs to a group of proteins called ribosome inactivating proteins, which inactivate ribosomes and, therefore, reduce protein synthesis (Makkar et al., 2011). However, curcin is also found in edible crops such as spinach, beet root and cereal grains where it does not seem to alter protein metabolism (Nesseim et al., 2012). Jatropha contains trypsin inhibitors that prevent protein digestion and have deleterious effects on growth performance, notably in monogastric animals (Rackis et al., 1981). 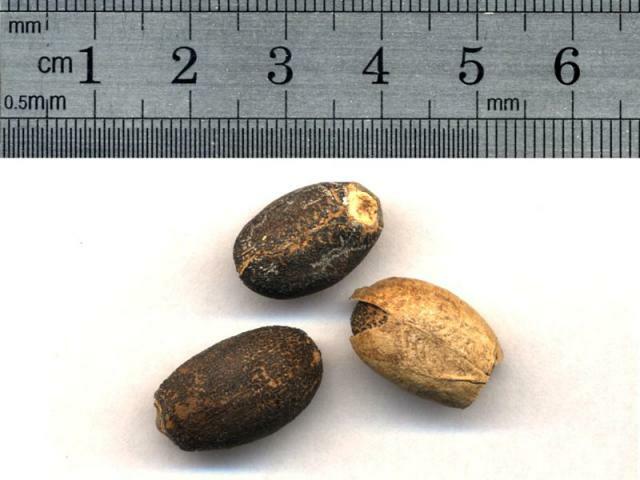 Jatropha curcas seeds contain saponins, which are bitter, have haemolytic activity and are toxic, particularly to fish (Cseke et al., 1999). Raw Jatropha curcas kernel meal contains 2-3.4% DM saponins (Makkar et al., 1998; Martinez-Herrera et al., 2006), which is lower than in soybean meal (4.7% DM) and have very mild haemolytic activity (Makkar, personal communication). Phytates are present in jatropha kernel meal (6-10% DM, Makkar et al., 1998; Martinez-Herrera et al., 2006), but their effect can be alleviated with phytase enzymes (Makkar et al., 2012). Ruminants should be fed only with detoxified jatropha products or with those from non-toxic genotypes or species. In vitro organic matter digestibility (apparent and true) and metabolisable energy (gas method) for Jatropha curcas leaves were respectively 60%, 82% and 7 MJ/kg. These were among the highest estimated values compared to other agricultural by-products, and drought-tolerant plants and browses in Syria (Al-Masry, 2003). Raw jatropha seeds were found extremely toxic to goats (Adam et al., 1975), sheep and calves (Ahmed et al., 1979a; Ahmed et al., 1979b). Phorbol esters cannot be degraded by rumen microbes and cause severe toxic symptoms in ruminants (Makkar et al., 2012). It is, therefore, advisable to use only detoxified jatropha kernel meal or kernel meals obtained from non-toxic genotypes. Detoxified jatropha kernel meal has been studied as a protein source for goats and lambs and can be used safely, economically and successfully in these species. Jatropha kernel meal from non-toxic genotypes or species have not been investigated in in vivo studies for ruminants. Based on in vitro studies, well-detoxified jatropha kernel meal or meal from non-toxic jatropha genotypes can be used as a good quality protein source in ruminants. Jatropha kernel meal (heated to 121°C at 66% moisture for 30 minutes) from toxic and non-toxic genotypes was found to have lower in vitro OM digestibility and metabolizable energy (gas method) than soybean meal (78-77 vs. 88% and 10.9-10.3 vs. 13.3 MJ/kg, respectively). The in vitro (pepsin + trypsin) protein digestibility was similar to that of heated soybean meal (89-90 vs. 91%), whereas the 24h in vitro rumen protein degradability from toxic and non-toxic jatrophas were much lower than that of soybean meal (43 and 29% vs. 81%). The particularly low value of N degradability of non-toxic jatropha meal suggests that it has substantial amounts of rumen-undegradable protein that can be used post-ruminally (Makkar et al., 2009; Makkar et al., 2012). Other studies have shown that in vitro organic matter digestibility of jatropha kernel meal was lower than that of soybean meal (49-61 vs. 64% Triastuty et al., 2009) and may be reduced by detoxification processes (from 51 to 61%, Ouskoueian et al., 2011). Moist heating (66% moisture, 121°C for 15 min) is much more effective in inactivating trypsin inhibitor (Makkar et al., 2012). Detoxification by fungal fermentation improved the protein content by 10-15%. Fungal fermentation also enhanced total lipid and fatty acids (Belewu et al., 2011). In Egypt, detoxified jatropha cake replaced up to 70% of soybean meal in a concentrate feed mixture fed to lambs without any adverse effect on performance. Economic efficiency was slightly improved with the jatropha supplement compared to the control ration (El-Zelaky et al., 2011). Jatropha kernel meal detoxified with lactic acid bacteria replaced up to 50%, and even up to 70%, of soybean meal in concentrate feed mixture without any adverse effect on lamb performance (Abo El Fadel et al., 2011). In Brazil, the inclusion of 20% (DM) of fungal detoxified jatropha kernel meal in the diets of growing goats did not result in changes in blood parameters or clinical symptoms of poisoning (Kasuya et al., 2012). In Nigeria, fungal detoxified jatropha kernel meal replaced 50% soybean meal in the diet of West African Dwarf Goats, increasing DM intake, weight gain (1380 vs. 708 g/d) and tissue deposition. Full replacement of soybean meal by jatropha kernel meal was less efficient (weight gain of 860 g/d) (Belewu et al., 2011). Non-detoxified jatropha kernel meal is toxic to pigs. When the detoxification procedure fails to remove completely and/or to neutralize phorbol esters and/or the other toxic anti-nutritional factors, dietary jatropha meal was found to cause severe adverse effects (diarrhea, death, etc.) in growing-finishing pigs (Chivandi et al., 2006). It is recommended to incorporate jatropha kernel meal in pig feeds only when it is certain that the product has been thoroughly detoxified. Detoxified jatropha kernel meal supplemented with lysine replaced up to 50% of the soybean meal protein in diets for growing pigs without any negative effects on health and growth performance (Haifeng Wang et al., 2011). In finishing pigs, a linear increase of inclusion rate of detoxified and extruded jatropha kernel meal (from 0 to 8%) resulted in a significant reduction in the growth rate of finishing pigs linked to a decreased voluntary feed intake. These effects were attributed to the presence of traces of phorbol esters (Berenchtein et al., 2014). Raw jatropha seeds and kernel meal are toxic to poultry, mainly due to the presence of phorbol esters (Makkar et al., 1997). This acute toxicity can depress growth even at low inclusion rates, and may cause mortality at higher levels (Annongu et al., 2010; Ojo et al., 2013; Sumiati et al., 2011). Several other antinutritional factors present in jatropha are also harmful to poultry (Makkar et al., 1997). Raw jatropha products should, therefore, not be used. It is also not advisable to use jatropha products in poultry feeds, except in the case of industrially detoxified products, following a confirmation trial. The detoxification of jatropha products has led to better performance in most cases when compared to raw jatropha, but performance was still depressed in broilers (jatropha seeds: Annongu et al., 2010; jatropha kernel meal: Aguirre Jamarillo, 2011; Pasaribu et al., 2010; Sumiati et al., 2011), and layers (Sumiati et al., 2012) when compared to the control diets. In some cases the detoxification processes led to an actual improvement and to performance close to that from the control diets (Granda Paz, 2012; Boguhn et al., 2010; Sumiati et al., 2009). More sophisticated detoxification methods and the use of non-toxic varieties or species of jatropha may facilitate the use of jatropha products in poultry diets in the future. The use of Jatropha curcas kernel meal is not yet recommended in rabbit feeding. Untreated Jatropha curcas kernel meal introduced in rabbits diets resulted in a reduction of feed intake and in a significant growth rate reduction of more than 30%, as shown in the following figure (mean values with different superscripts are significantly different at P<0.05) (Abdel-Shafy et al., 2011). Detoxification by fermentation with Bifidobacterium (culture for 15 days at 37°C) suppressed haematological changes but feed intake remained significantly reduced, by 28%, when fermented jatropha kernel meal was introduced at 6% or 12% in rabbit diets (Widiyastuti et al., 2014). Using jatropha kernel meal may be a non-chemical method to treat ectoparasites in rabbits. Rabbits experimentally infected with the tick Hyalomma marginatum marginatum showed a drastic reduction in tick reproduction after being fed a diet containing 10% jatropha kernel meal with no serious effects on rabbits liver and kidney functions (Nasr et al., 2011), though some haematological alterations were recorded (Abdel-Shafy et al., 2011). Dried Jatropha tanjorensis leaves introduced in diets for growing rabbits at up to 25% caused erratic growth (both positive and negative weight changes), with no clear relation to the inclusion rate though some haematological parameters were improved (Orhue et al., 2008). The renal function also improved with a significant reduction of serum urea concentration. However, there were also signs of hepatic toxicity (Akhigbe et al., 2009). Until proven harmless, Jatropha tanjorensis leaves cannot be recommended as a feed ingredient in rabbit nutrition. Detoxified jatropha kernel meal replaced 50% of the fish meal in common carp diets without altering health parameters (no changes in blood parameters or haematocrit) and without negative effects on feeding time, palatability or fish growth. Feeding common carp with detoxified jatropha kernel meal increased amino acid availability. Protein digestibility was over 90% and lipid digestibility was in the range of 74-90%. However, lower digestive enzyme activity was reported, possibly due to phytates but this problem could be alleviated by the use of phytase. Feed conversion ratio remained unchanged as well as the protein productive value (Makkar et al., 2012; Kumar et al., 2011a). Feeding common carp on detoxified jatropha kernel meal resulted in higher lipid deposition that could be due to higher carbohydrates and lower cholesterol contents in plasma and fish muscle (Kumar et al., 2010). Feeding detoxified jatropha kernel meal also resulted in more whole body crude protein (Kumar et al., 2011a). Detoxified protein isolate of Jatropha curcas is very palatable to common carp (Kumar et al., 2012b). Detoxified protein isolate replaced 75% fish meal in carp diets without compromising health or growth, but the best results were obtained when it replaced only 50% fish meal (Kumar et al., 2012b). A diet containing detoxified jatropha protein isolate (at 75% fish meal replacement level) had protein and energy digestibilities similar to those of the control diet, which may be due to the removal of antinutritional factors during processing and lower non starch polysaccharides. Fish fed on detoxified jatropha protein isolate had greater lipid retention and this was positively correlated with the inclusion rate of the isolate. Protein retention was significantly higher in carp fed detoxified jatropha protein isolate. This could be explained by a particularly well balanced amino acid profile in detoxified jatropha protein isolate (Kumar et al., 2012b). Kernel meal produced with non-toxic genotypes of jatropha were used to replace 50% fish meal in the diets of common carp fingerlings. The results obtained with untreated kernel meal (body weight gain, feed conversion ratio, etc.) were statistically similar to those obtained with the control diet though they tended to be lower. Heating kernel meal was found to be useless as it reduced the digestibility of protein and energy due to a Maillard reaction (Makkar et al., 1999). Detoxified jatropha kernel meal replaced 50% fish meal in rainbow trout without affecting health, growth rate, feed conversion ratio, protein efficiency, protein productive value and energy retention. A higher inclusion rate (62.5% fish meal replacement) resulted in poorer growth, probably due to the high phytate content of jatropha, also a relatively high carbohydrate content not well digested by carnivorous fish or to an insufficient supply of sulphur-containing amino acids (11.3 g/kg vs. a requirement of 13 g/kg). Detoxified jatropha kernel meal reduced cholesterol in plasma and muscle of rainbow trout (Kumar et al., 2011b). Kernel meal of the non-toxic species Jatropha platyphylla heated at 121°C for 15 minutes under 66% moisture replaced 50 or 62.5% fish meal in Nile tilapia diets fed for 12 weeks without altering fish health. Most blood parameters were unchanged or remained within normal ranges; haematocrit, red blood cell counts and blood glucose were higher, while cholesterol decreased in plasma. Growth performance of Nile tilapia fed on heated Jatropha platyphylla kernel meal was similar to the control. Nutrient utilization, energy expenditure and metabolizable energy were not different from the control diet indicating that heated Jatropha platyphylla kernel meal could be fed as a protein feed for Nile tilapia (Akinleye et al., 2012; Makkar et al., 2011; Kumar et al., 2012a). Cseke, L. J. ; Kaufman, P. B. ; Warber, S. ; Duke, J. A. ; Brielmann, H. L., 1999. Natural products from plants. CRC Press LLC., Boca Raton, USA. Joshi, C. ; Mathur, P. ; Khare, S. K., 2011. Degradation of phorbol esters by Pseudomonas aeruginosa PseA during solid-state fermentation of deoiled Jatropha curcas seed cake. Biores. Technol., 102 (7): 4815-4819. Kasuya, M. C. M. ; Luz, J. M. R. da ; Pereira, L. P. da Silva ; Silva, J. S. da ; Montavani, H. C. ; Rodrigues, M. T., 2012. Bio-detoxification of jatropha seed cake and its use in animal feed: chapter 11. In: Fang, Z. (Ed.). Biodiesel - Feedstocks, Production and Applications. pp. 309-330. Kumar, V. ; Makkar, H. P. S. ; Amselgruber, W. ; Becker, K., 2010. Physiological, haematological and histopathological responses in common carp (Cyprinus carpio L.) fingerlings fed with differently detoxified Jatropha curcas kernel meal. Food Chem.Toxicol., 48 (8-9): 2063-2072. Makkar, H. P. S. ; Becker, K., 1999. Nutritional studies on rats and fish (carp, Cyprinus carpio) fed diets containing unheated and heated Jatropha curcas meal of a non-toxic provenance. Plant Foods Human Nut., 53 (3): 183-192. Widiyastuti, T. ; Indraji, M. ; Wibowo, A. ; Hendroko, R., 2014. Biorefinery of jatropha seed cake by lactid acid bacteria and the effects on hematological profile of rex rabbit. Renew. En. En. Conv. Conf. Exh., August 21st – 23rd, 2013 Jakarta, Indonesia., Communication.